In case you didn’t already know, homemade soap is better than commercial soap in every single way imaginable. The textures, the effectiveness, the scents, the colors- you name it. Most commercial soaps are nothing more than bars of detergent that contain harmful chemicals. Compare that with homemade soap, which is all natural and contains helpful ingredients. So how do you get your hands on some homemade soap? You have two options: you can either buy it, or you can make it yourself. In this guide we will examine both options. First it’s good to know what different types of homemade soap are out there. There are different types available- all of them with different ingredients, and all of them are worth trying out. There are many soapmakers who firmly believe that soap from animal fats (tallow or lard) is superior. This is certainly debatable, but soap from animal fats is usually creamier and longer lasting. It’s also better for the environment because you are essentially recycling the fat and making good use for it. For this reason it’s cheaper as well. This is the most popular option and you can find so many different recipes to try out. Vegetable fats such as coconut oil are easier to store and easier to buy. However they are usually more expensive. There’s more variety and you can mix different oils so it’s easy to make your own combinations if you want. The downside is that sometimes the vegetable-based soaps don’t come out as hard as the other types. Instead of soap made with water, you can use goat milk instead. It’s more difficult to make because you have to control and monitor the temperature of the milk, but many people love this type of soap. It’s easy to see why because there are so many benefits to using it. Goat milk is filled with alpha-hydroxy acids which have anti-aging properties. It’s also filled with all the essential vitamins- B, D, C, E. These are the top vitamins for skin and they will get absorbed directly into your skin! The milk is good for acne because of the anti-bacterial properties. It’s also the best for those with dry skin. Disclaimer: Making soap with the cold-process method involves using sodium hydroxide (NaOH), otherwise known as lye. This is a powerful chemical that can cause damage if it touches your skin. Therefore safety is very important, and you must ensure that you take the proper precautions. When people think of making soap, they think of it being difficult. But it’s actually not that hard. We wouldn’t say it’s easy, just because there are a lot of steps and you have to pay close attention to what you’re doing at all times. But it’s not difficult once you know what you’re doing. The first time you make soap with the cold process method it’s going to take close to an hour. But after multiple batches, you should be able to do it in less than a half hour. The true way of making soap is with the cold process method or the hot process method. There’s also the melt and pour method, but with this method most of the steps are already done for you. So we are going to lay out the steps for the cold process method, which is now the most common way of making soap. Essentially the way it works is that you are mixing lye water with fats, and this creates a chemical reaction called saponification. Then you put the soap in a mold and wait for it to cure. 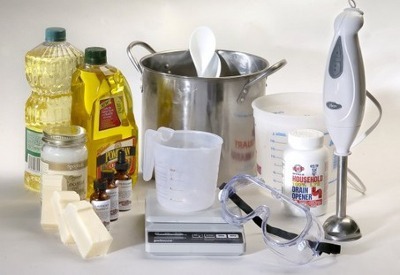 Making your own soap isn’t cheap, especially at first. The start-up cost is going over $100. So before you go and buy materials, make sure this is a hobby that you definitely want to pursue. Note: You want to have exact measurements. The more exact your measurements are, the better the outcome is going to be. This recipe is called Shea Butter Supreme and it’s perfect for beginners. The ingredients make for a great moisturizing bar. You can get all of the ingredients for good prices online through Amazon or Brambleberry. We recommend buying only around the minimum quantity to start off with. If you find that you really enjoy making soap, then you can start buying in bulk to save money. First you have to make sure that your work area is clean, and that everything you need is in your general area. This includes running water. You also want to make sure you are wearing the correct clothes- a long sleeve shirt and long pants. The first big step is to mix the fats together. To do this you are going to measure and add the correct amount of fats into one of your pots and then stir it all together. You will probably have to melt the oils, so put your pot on the stove and put the heat on low. This is where you want to be extremely careful. Make sure your googles and gloves are on securely. You will need to have two measuring cups on hand (one for the lye and one for the water) as well as a bowl of ice cubes. When you add the mixtures together, there will be a lot of steam generated so it’s best to do this procedure either outside or directly under your stove-top. To start, first measure out the correct amount of lye and water that you need for the recipe. Once you have a cup of water and a cup of lye with the correct amounts, then you are going to slowly add the lye to the water. Always remember to add the lye to the water, and not the other way around. This is very important. Keep stirring for at least a couple minutes, you’ll want to make sure all the lye is dissolved. Take the pot of lye water and place it into the bowl of ice cubes. Before you can mix the two solutions together, you have to wait for the lye water to cool down. Once it’s in the 90-110 Fahrenheit range, then you can you can pour it into the pot with the fats. Use a stick blender to mix it all together and keep blending until it gets relatively thick. This is now the time to add any scents or colorants. This is the easy part. It doesn’t matter which type of mold you use, any type will do. Just remember to line your mold- we recommend using freezer paper. Start to slowly pour the soap into the mold. Scrape out any excess soap and then cover the mold with a towel. It’s good to cover the mold just so nothing will interfere with the soap while it’s curing. Check to see how your soap looks after 24 hours. There’s no need to check it before then. This is the start of the curing period and it’s when the water gets evaporated. Cut the bars into pieces and set them to dry in a well-ventilated area. Before you can use the soap, you have to wait 5-8 weeks. The longer you wait, the harder the soap is going to be. After about a few days, you’ll want to take another look at the soap and make sure it looks okay. You should also take out a pH strip and test the acidity of the soap. You want it to be in the 7 to 10 range. If it’s too acidic (above 12) then you have to throw away the soap. But don’t feel bad, even the professionals can’t make perfect soap each and every time. Buying homemade soap is a lot easier than making it. It’s also more efficient, especially if you buy online. We’ll show you below where you can buy quality homemade soap at reasonable prices. It may sound obvious, but local soap stores are fantastic places to buy homemade soap. You will be amazed once you first step foot into one of these stores. You’ll be able to see loads of different types of soaps and different types of designs. These stores try and separate themselves by making creative designs, and they will proudly display the bold designs for everyone to see. The disadvantage is that not everyone lives near a soap store, and the retail prices will usually be high. Unlike farmers markets or online, soap stores have a lot of fixed costs so they aren’t able to sell their individual soaps for cheap prices. Not everyone lives near a farmers market, but if you do then it’s a fantastic place to buy soaps. At a medium to large farmers market, there’s usually at least a couple booths selling soap. It’s a great way to meet the actual soap maker and to ask them any questions you may have. They can tell you all about their soaps and how they’re made. After you establish a friendly relationship with them, you can even request custom-made soaps. The easiest and most convenient way to buy all your soaps is online. Just about every soapmaker sells online, it’s not just the big companies. So rest assured you will still be supporting small business while also getting a fantastic product. The best deals are usually found on Amazon. Here you can find a variety of soaps from different makers, and all at affordable prices. 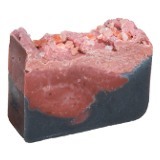 This is a nice looking homemade soap where the main ingredient is Himalyan Pink Salt. The secondary ingredients include rose clay, charcoal, and Red Brazilian Mandarin Essential Oil. These ingredients all come together to produce a gentle, cleansing soap that does a fantastic job with exfoliating your skin. Fall River’s Himalyan Soap is definitely a unique recipe and we highly recommend that you try it out. It will leave your skin feeling very clean. These are vegetable oil based soaps that feature only the purest natural ingredients. What’s unique about this brand is that they don’t use distilled water. Instead they use mountain spring water which is used to retain more minerals from the oils. The soap itself has a strong scent and is great for moisturizing. You have the option of choosing three different scents: Patchouli Rose, Kaffir Lime, and Apple Cider. Beauty and the Bees’ Patchouli Rose soap is the most popular option. This is a goat milk soap made from 100% raw goat milk. It also features raw honey, ground almonds, and sweet almond oil. The end result is a moisturizing soap that is great for cleansing. It’s quick absorbing and it doesn’t leave any oil residue on your skin. 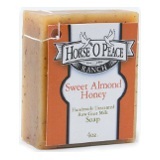 This Horse O Peach Ranch soap is long lasting as one four ounce bar can last from 4-6 weeks. This makes it a great value. So if you’re curious about goat milk soap, then this is the brand for you. Once you start using homemade soap, there usually isn’t any going back. You’ll wonder how you ever used the commercial brands. The quickest way to get started is to just buy a bar and try it out. And if you have the time and the interest, then you can consider making your own bars at home.